Imagine a wonderland of snow blanketed trails winding though picturesque valleys, snow-capped mountains, forested trails and historic villages. This is snowmobiling in Vermont – a North Country experience not to be missed. For more than 30 years, a remarkable network of over 6,000 miles of groomed and connector trails has wound its way through our beautiful state. In fact, Vermont has set the standard for excellence in maintaining trails that are well marked and easy to navigate, furnishing user friendly maps and providing access to fuel and plentiful nourishment to snowmobilers. The V.A.S.T. (Vermont Association of Snow Travelers), together with local clubs and over 120 groomers, maintains this huge network for riders to enjoy. Community clubs offer events every weekend to add to the fun. 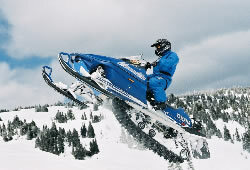 The Northeast Kingdom has long been a major hub for snowmobiling, including the Glover Trailwinders. A typical snowmobile season in Vermont is December 1 through April 1. Take a guided tour from an area snowmobile operator, or ride on the V.A.S.T. trail network. To do so, you must purchase a V.A.S.T. trail pass for your legally registered snowmobile through a local club – and you’re on your way! For further information on purchasing a pass and rules for the trail, visit VTVAST.org. Be sure to ask about our V.A.S.T. Member Discounts – offered all season long! Further information: Vermont Association of Snow Travelers (V.A.S.T.) – (802)723-9702, or visit VTVast.org for trail maps and further information.